Starlight is the most magical little unicorn around. 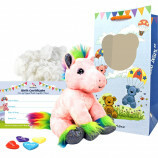 This kit contains Starlight Unicorn 8" animal skin, super-soft stuffing, heart charm, birth certificate, party invitation and deluxe carry bag. 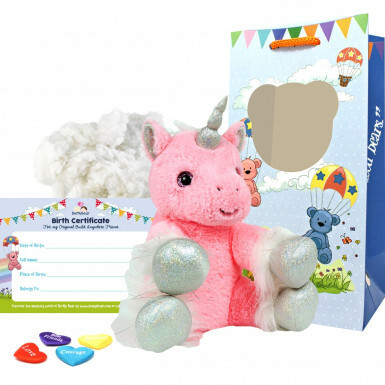 Our Starlight Unicorn is a bright pink unicorn with silver horn and hooves. 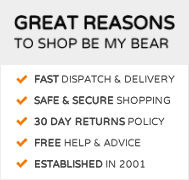 Starlight Unicorn is a member of the eight inch range of build anywhere mythical animals from Be My Bear. Starlight Unicorn originally comes from Galloway Forest Park in Scotland, which is actually the largest forest in Scotland! Unicorns have been mentioned in stories and heraldry for many many years in Scotland, and it's no surprise with Starlight living in Galloway Forest Park. It is said that Starlight Unicorn has magical powers bestowed to her from the starlight each night, making her a very special unicorn indeed. 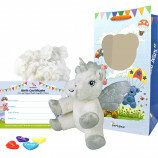 Starlight Unicorn is suitable for children aged three and over and is the ideal gift for special occasions and teddy bear making birthday parties. 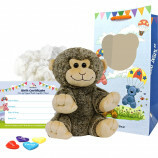 As with all of Be My Bear's teddy bear and stuffed animal making kits you will receive your Starlight Unicorn skin with one-way zip closure, a bag of soft and fluffy stuffing, our satin make-a-wish heart charm to bring Starlight to life, a birth certificate, party invitations and instructions. 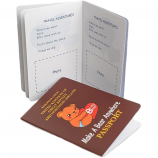 To complete the package we also include a luxury gift bag so Starlight can be carried around in style.